GEN. SANTOS CITY (Sept. 9) – Undefeated Romero “Ruthless” Duno and Reymart “Gensan Assassin” Gaballo are both eyeing for their knockout wins against their separate opponents from Thailand in tomorrow’s exciting “Battle in Tupi” at the Tupi Municipal Gym in Tupi, South Cotabato. Both Duno and Gaballo made their weights today at 129 and 119 lbs., respectively. Their rivals Paiboon Norkam (129 lbs.) and Manot Comput (119 lbs.) also submitted identical weights. 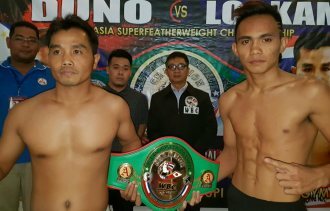 Duno and Norkam are vying for the vacant World Boxing Council (WBC) Asian Boxing Council Confederation (ABCO) super featherweight title while Gaballo and Comput will fight for the vacant WBC ABCO super bantamweight crown. The 20-year old Duno is toting 10 wins with only one loss and no draw while 37-year old Lorkam has a record of 16 wins against 8 losses and no draw. “Our Thai boxers are ready to fight and have more stamina since they have more experienced in Muay Thai,” said lawyer-matchmaker Narong Hengtrakul of Thailand. Lorkam previously won by a TKO against fellow Thai Natdanai Pengthong last September. He also fought but lost to Nathaniel May by a TKO in their battle for the vacant IBF Australasian featherweight title last May 7 in Australia. The 33-year old Comput (12W-13L), on the other hand, is coming from two back-to-back knockout wins while the 20-year old Gaballo is still unbeaten with 14 wins and 12 knockouts. “Gaballo must score a big win since he is already leaving for the US to train with Cuban coach Moro Hernandez,” said Sanman Promotions chief executive officer Jim Claude “JC” Manangquil. The official weigh-in was supervised by WBC Supervisor Dr. Nasser Cruz, who was assisted by GAB Manila supervisor Ralph Diokno and the GAB Davao under Arlene Olondriz. The boxing card, which is supported by Tupi Municipal Mayor Reynaldo Tamayo Jr. will also feature US-bound “Magic” Mike Plania and John Vincent “Mulawin” Moralde, both also of Sanman Boxing Stable. Plania, who is currently the World Boxing Federation International bantamweight title-holder and his rival Jhonrey de Asis (6-1-1) both tipped the scales at 122 lbs. for their 10-round non-title bout. Moralde, who holds the WBF International featherweight crown, submitted 127 while his opponent Hagibis Quinones was 130 lbs. Plania and Moralde also both leaving for Miami, Florida together with Gaballo. “Kaya dapat manalo din sila pareho tulad ni Gaballo,” said Mananquil. Also featured in the undercard are super flyweight Engelbert Moralde (115 lbs.) against Jun Eraham (116 lbs.) and Jayson Mama (109 lbs.) versus Roger Salaton (108 lbs.) in the 4-round curtain raiser.